QED Performance Graphite Optical review | What Hi-Fi? Best optical digital cable, Awards 2012. Fantastic value for money. 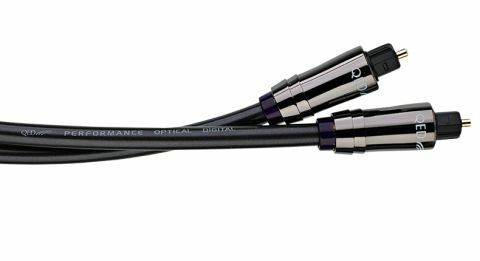 Optical cables are key in various audio set-ups, from Sky+HD 5.1 sound to digital music, and in our experience you can buy better quality than a free bundled wire. The Performance Graphite is a well-made cable, with a flexible but tough body, and beautiful, high-quality plugs. The sound it conveys is versatile and balanced, equally adept at expressing bass and treble. This sturdy little cable worked well with our reference CD and DAC set-up, allowing them to reveal verve and punch when needed, together with transparency and a pleasing sense of detail. Play Rodrigo y Gabriela’s Hora Zero and delicate nylon strings are pronounced and authoritative, while drums pack a visceral punch. It is also startlingly clear, conveying a real sense of texture and painting a detailed aural picture. And the price is great for the quality. That's why it's won awards two years in a row.